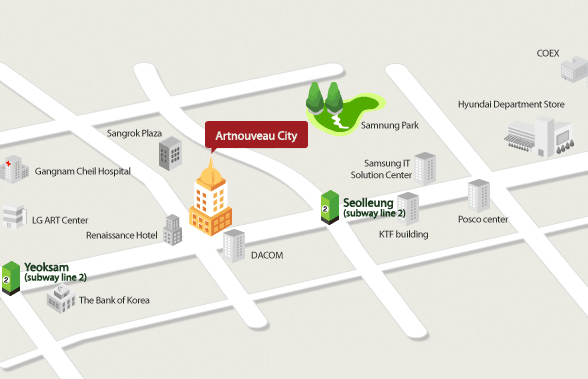 5 minutes to walk from exit 8 at the yeoksam station & exit 5 at Seolleung station, Subway line2. 10 Kilometers From Coex Mall. * All Dollar rates are appllied to 1,000 Korean Won. Artnouveau City Seoul Korea - Artnouveau City Seoul Korea 50% Off Booking, Somerset Palace, Grand Hilton Suites, Fraser Suites Korea, Han Suites, Hyundai Residence, Human Star Ville, Human Touch Ville, Seoul Residence, Provista, Coatel, M Chereville, Ramada Hotel Suites, Fraser Place, Oakwood Korea and Dormy in Seoul, Artnouveau City, DMC Ville booking services provided.